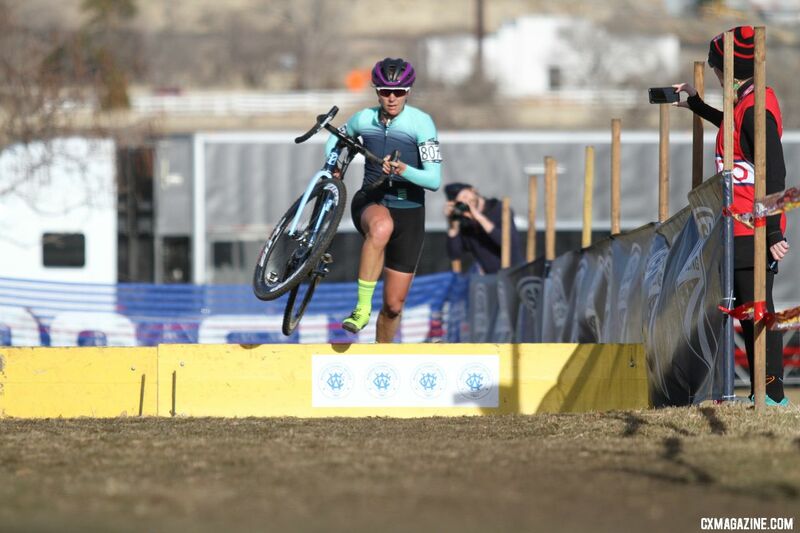 Meredith Miller may have retired from professional racing, but that has not kept her away from cyclocross nor chasing National Championships despite living in the Katie Compton era. 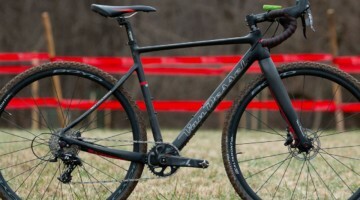 She has continued racing domestically and showed up this year at Nationals with a microphone in hand to announce the week of racing and also compete in the singlespeed category. Miller debated racing the singlespeed race in 2017 in Hartford, but said she felt it might be "too soon" after retirement. 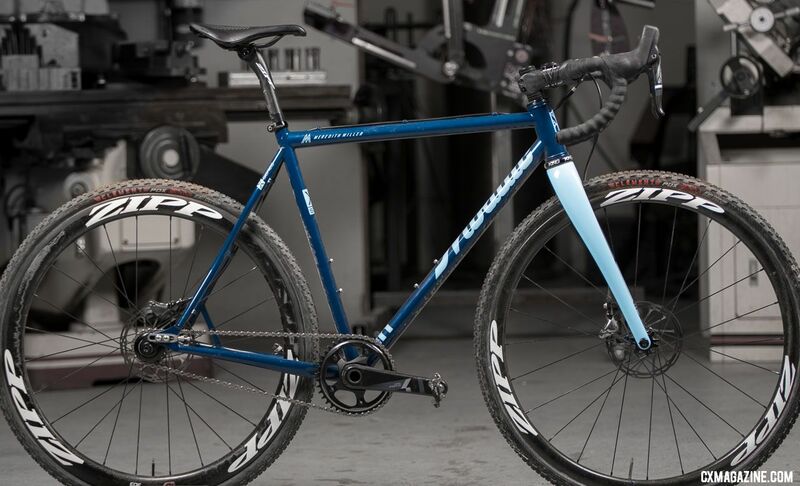 However, in 2018 she was ready to follow the successful path of 2015 Singlespeed Champ Mo Bruno Roy and pilot a custom singlespeed cyclocross bike to win a title that eluded her during her pro years. The race is actually what brought Miller to Reno and the call-up for announcing duties came after. We checked in with Miller after the race to get a closer look at her race winning rig that she had only six rides on before her championship laps. Miller’s frame is a custom built XS-1 cyclocross frame from Boulder-based frame builder Mosaic Cycles using True Temper OX Platinum tubing. While the True Temper stopped producing bicycle tubing in 2016, Mosaic purchased a large stock to smooth out the transition to a new supplier. "When True Temper announced their departure from manufacturing this tubeset, we bought up some stock so we'd have some available until we've found a replacement that we think is on par and will offer us similar ride qualities." said Phillip Ball at Mosaic. 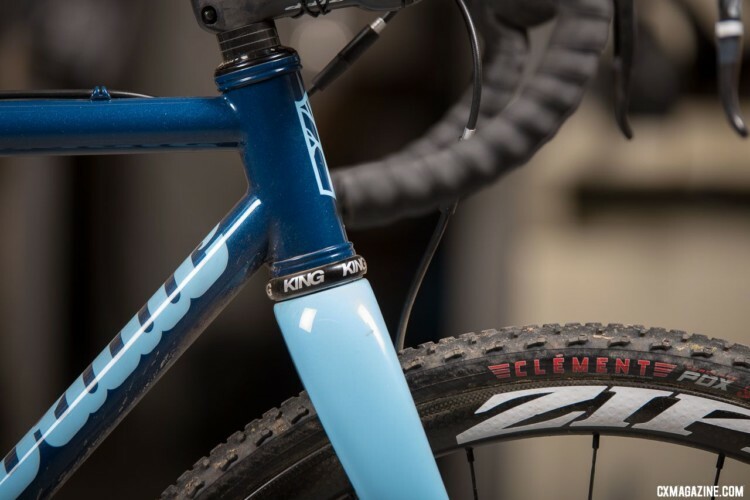 "We've been working with Vari-Wall Tubing and are close to a new spec for the 2018 cyclocross season." 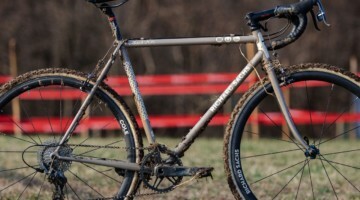 The steel frame has been used for the last four years by Mosaic’s singlespeed cyclocross team, Single Barrel, but Miller’s bike was built around geometry from another of her bikes for consistent fit and handling. It is painted a navy blue with sky colored accents and is outfitted with stainless steel sliding 12x142mm thru-axle dropouts from Paragon Machine Works to allow chain tensioning without a derailleur, a 44mm-diameter head tube with a Chris King headset and an ENVE cross fork with post mount brakes and 12x100mm thru-axle dropouts. Miller’s name is painted near the seat cluster. 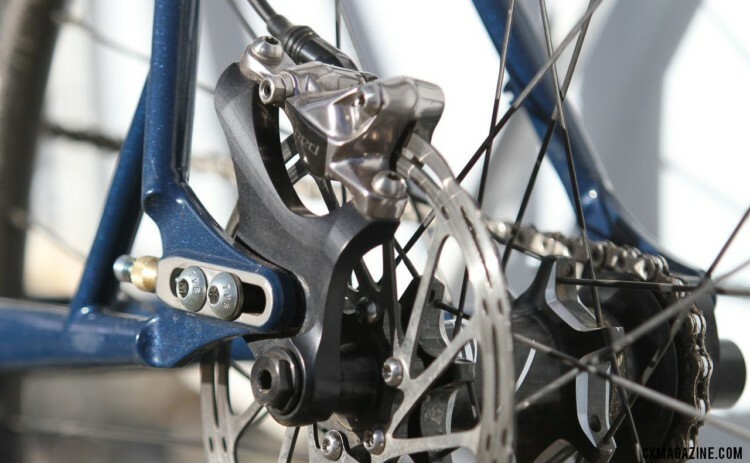 The sliding dropout on the frame has an integrated post brake mount to keep caliper alignment consistent with the wheel and features a buttress in the non-drive rear triangle to work against braking force. 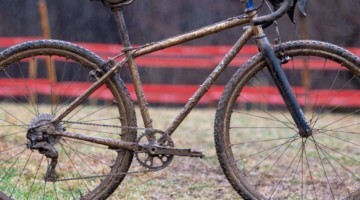 While the frame was set up purely as a singlespeed, Paragon offers a dropout insert with a derailleur hanger and the frame has cable guides for a rear derailleur, so the bike is not locked into a singlespeed configuration. 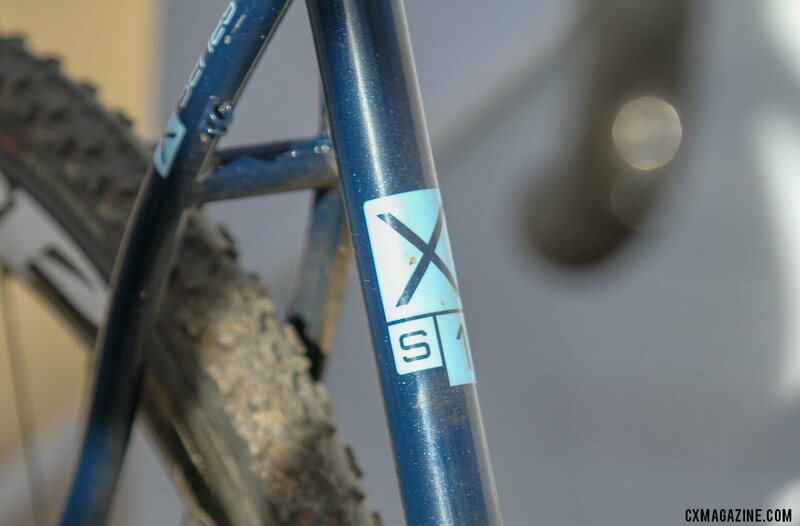 S-bend seat stays are intended to add compliance into the frame and give the bike an elegant look. Miller's winning build is purely one-gear focused. 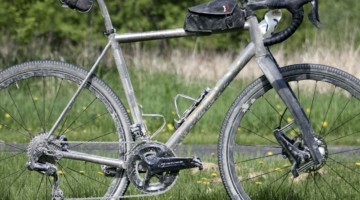 Miller is a SRAM brand ambassador and so the majority of her build uses the brand’s components. 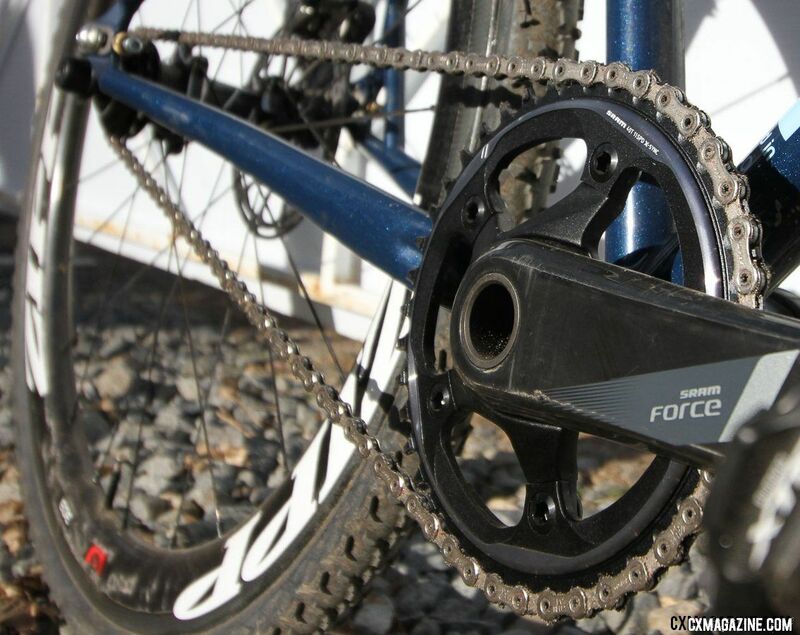 She ran a 172.5mm SRAM Force GXP crankset, but played with gearing. With a title on the line, it wasn’t "run what you brung" with MIller. Throughout the week, as conditions changed, Miller changed her mind on gearing. "I went from 38x17 to 38x18, and back to 38x17 and then was told I needed to go bigger than I would think for race day so went to 40x17," Miller said of her gearing choice. Her SRAM Force brake levers have the shift internals removed for a cleaner setup and a few grams of weight reduction. Shimano XTR M9000 pedals provide a platform through which to apply power. Miller’s brake levers were attached to SRAM Force HRD hydraulic calipers which were paired to SRAM Centerline 6-bolt rotors in 160mm. Rolling stock consisted of Zipp 303 Firecrest tubular wheels and Clement PDX tubular tires in 700x33mm. The hubs were set up to accept the frame’s 12mm thru-axles. With the exception of her Specialized Power Pro saddle, the rest of the bike is supplied by SRAM subsidiary Zipp. 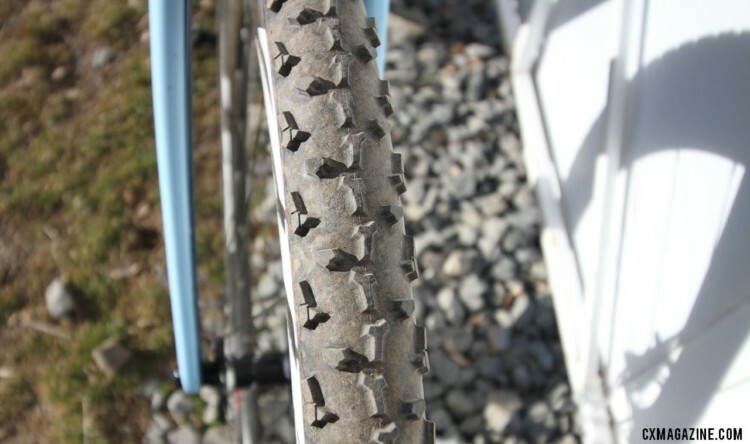 Her seatpost is a carbon SL Speed with 20mm of setback. Miller’s front end consisted of a Zipp Service Course SL handlebar and a carbon SL Speed stem. What’s next for Miller and her Mosaic? 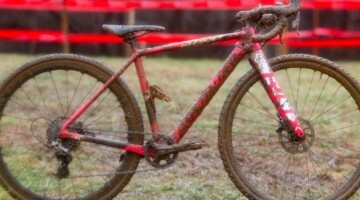 We asked her if she had hopes to add some ink to her budding singlespeed career with a run at the SSCXWC (Singlespeed Cyclocross World Championships) and keep the title in American hands after Megan Chinburg’s win in Italy in December. The rumors we’ve heard are the race may land in Belgium or Bend (where the singlespeed mountain bike champs will also be this year). When she found out it might return yet again to Oregon, it sounded like a "World Championship" might be in her future, at least if it’s stateside. "Ooh, Bend." she said over what sounded like shot glasses being lined up on the counter in the background. "I’ll go there in a heartbeat!" Miller exclaimed. Training for the tequila shortcut might already be underway.